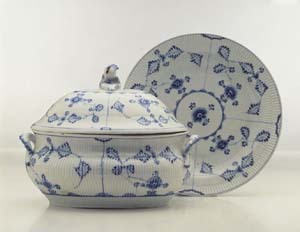 The Royal Copenhagen Porcelain factory was founded in 1775, under the protection of Queen Juliane Marie, by the chemist, Frantz Heinrich Müller, who following years of experimentation and trials finally mastered the production the coveted hard porcelain. The three waved lines, symbolising Denmark’s three straits: Øresund, Store Bælt and Lille Bælt, are adopted as the trademark. one above the other, were adopted as a factory mark in 1775. The factory was beset by difficulties during its first few years, but the problems of ‘poor raw materials, lack of experience, unsuccessful firings, disappointing experiments’ were eventually overcome, and in 1779 the absolute monarch King Christian VII assumed financial responsibility, thus guaranteeing the future of the porcelain factory. Pictured left: Examples of the Blue Fluted pattern. As with many other early procelain factories the greater proportion of of Royal Copenhagen porcelain was painted cobalt blue before glazing. At the time it was the only colour to withstand the high temperatures required to fuse the porcelain mass and the glaze to make Chinese style porcelain. Royal Copenhagen continues to produce china and dinnerware in the traditional “blue and white style,” it has become the factory’s mark of distinction. The first dinner service pattern produced by the factory was the ‘Blue Fluted‘, a popular pattern with a number of companies since the taut stylised floral motive originated in China and was considered the epitome of genuine porcelain. 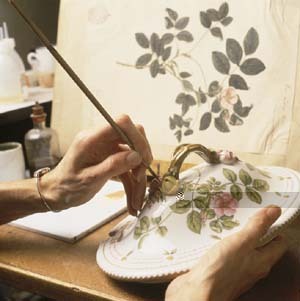 Royal Copenhagen still continues to paint the pattern by hand, even today. ‘Blue Fluted‘ would gradually become synonymous with Danish porcelain. In 1779 another blue dinner service was introduced and it is also still in production today the ‘Blue Flower‘, reflecting the contemporary European style of naturalistic flowers. Pictured right: The Blue Fluted pattern is still hand painted today. 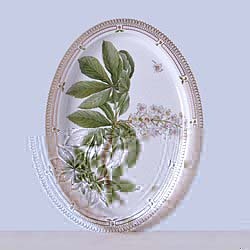 One of Royal Copenhagen’s most famous patterns is the ‘Flora Danica‘. This service, still in production, is renowned as the most exquisite and most expensive in the world. Pictured left: A Flora Danica serving bowl. The ‘Flora Danica’ was originally commissiooned in 1790 by the Danish king, according to legend, for Catherine the Great of Russia. Danish flora is reproduced on the porcelain copying the copperplates published in one of the Age of Enlightenment’s greatest botanical works, Flora Danica. When the service is delivered to the royal family, twelve years later, it comprises 1,802 pieces. The service is revived for the marriage of Princess Alexandra of Denmark to the future King Edward VII of England, in 1863. 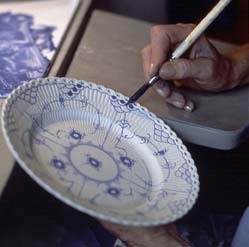 Pictured right: An artist painting the a Flora Danica design. During the early part of the 19th Century wars rage in Europe, and the English bombard Copenhagen in 1807 causing large-scale devastation that almost destroys the factory. Production in the factory is reduced and even stopped, but a marked change from 1816 to 1850 sees the factory flourish again not only in terms of growth but also in style and design. The Golden Age of Danish culture sees the porcelain factory’s artistic performance raised to such a pitch under Artistic Director G. F. Hetch’s leadership that the factory in 1851 is qualified to participate in its first official exhibition, the World Exhibition at the Crystal Palace, London. Absolute monarchy is abolished in Denmark in 1849 and the porcelain factory is now compelled to prove its viability on the free market. Following a period of decline the Royal Copenhagen Porcelain manufactory comes into private hands, in 1868. 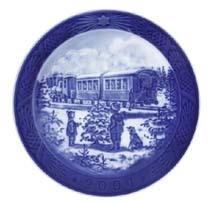 Pictured left: The 1895 Royal Copenhagen Christmas Plate. In 1882 the faience factory Alumina purchases the Royal Copenhagen Porcelain Manufactory, which shortly afterwards moves to a modern factory building at Alumina’s site in Frederiksberg, on the outskirts of Copenhagen. Royal Copenhagen still operates from here today. Other than its famous dinner service patterns Royal Copenhagen is also famed for its Christmas Plates and Figurines. 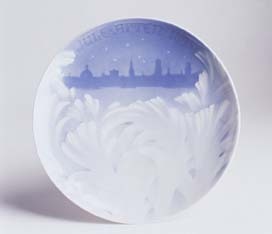 In 1895 the first Royal Copenhagen Christmas Plate is produced using newly developed underglaze techniques. Using a specific version, on which the decoration is cut in relief and interchanging layers of colour produce a variety of blue shades, the underglaze painter F.A. Hallin creates the first Christmas Plate. The production of Christmas Plates continues today. Pictured right: The 2004 Royal Copenhagen Christmas Plate. Royal Copenhagen is now the porcelain division of Royal Scandinavia which was formed with the merger of Royal Copenhagen and the he Swedish glass works Orreefors Kosta Boda. Royal Copenhagen had already bought Georg Jensen Silversmithy in 1972, and incorporated with Holmegaards Glassworks in 1985 and with Bing & Grøndahl in 1987. The intention was to secure a strong position for the Danish art industry globally. The latest merger, Royal Scandinavia, now sees the best of Danish and Swedish art industry combined. NOTICE – This site is not affiliated with Royal Scandinavia, Royal Copenhagen or any of its associated companies. The purpose of these pages is to provide information to collectors of Royal Copenhagen.